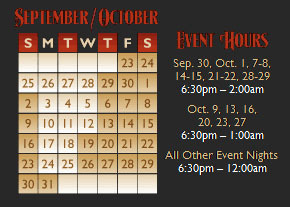 Home HHN 21: Are You In? See if you can beat the odds on select nights from September 23-October 31 and survive Halloween Horror Nights 21 at Universal Studios Florida. Test your luck and take your fate into your own hands as you venture into a nightmarish maze of 8 all-new haunted houses, 6 bloodcurdling scare zones, 2 outrageous live shows and more. It’s a game of wills to see if you can survive the odds while a horde of mutants, monsters, and maniacs roam the darkened studio streets. But be careful what you wager – because at Halloween Horror Nights 21, nobody beats the house. Join creature feature host, H.R. Bloodengutz, in his final televised broadcast as he presents a SCARE-athon of holiday-based horror that is guaranteed to cleave you screaming for more. Within every war, the Nightingales have appeared. Able to transform themselves to fit any setting, these savage banshees feed on the weak and the helpless. Patrolling WWI era trenches, you discover that you are more than just at war…you’re being hunted. The madness of Edgar Allan Poe’s greatest works has come to life. Step into the mind of the iconic writer, where every turn of the page takes you closer to the brink of insanity. Paranoia spreads like an epidemic among a group of researchers in an isolated Antarctic outpost as they are infected, one by one, by a horrifying creature from another planet. In a place where there is nothing, they found something. As snow falls on this normally serene gothic cemetery, the deceased souls that occupy its confines have their sights set upon you, ensuring that the chill you feel up your spine is more than just the cold of night. For decades now the city has been degrading from the effects of Acid Rain that still falls today, caused by factories which sprung up on the city’s edges during the 20th century. Those that have lived and survived the blistering decay are all alone in the city. Survivors have stripped the city of all life to sustain their own…dare to enter the ACID ASSAULT! Upon entering into the Canyon of Dark Souls, you will feel like a small spec of humanity as the overwhelming sense of death surrounds you. Creatures that dwell within the Canyon are not welcoming so walk slowly as to not disturb them! Enter, if you dare, into our garden where Evil grows. Nature has taken this once well manicured sanctuary back from the humans who once kept it. Now the creatures that inhabit the garden are making any human that enters their prey!!! Journey through the ever changing maze of darkness! This all black maze will morph and change as you walk through it!!! You will not be scared the same way twice! Enter if you dare into the lair of the LUCKY! Your choices will determine if you make it out alive! Witness lucks deadly wrath, will she choose you to be her next victim?! Party on as those two most excellent dudes return to skewer the biggest names in entertainment and pop culture. A seductive, hard-hitting and raw, extreme drumming experience is revealed at Halloween Horror Nights 21! Don’t just see 1 show as there are 3 different shows nightly. Make the choice and experience DEATH DRUMS!